UNIKO is designed to satisfy the massive request from restaurants, agritourisms communities and cuisines in search of a wood oven suitable for the needs of small restaurants and lovers of the traditional "Porchetta". The exterior of the UNIKO oven is made out of steel. In the interior of the oven, the employment of revolutionary materials guarantees a uniform cooking, perfect for any dish. 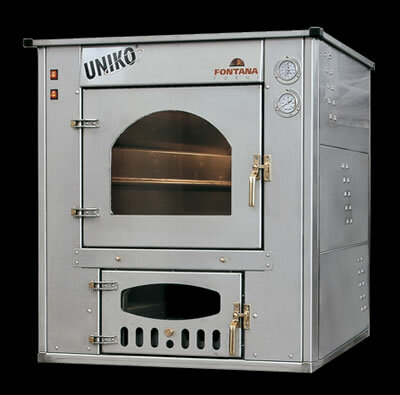 The careful attention to the needs of customers and the constant care in the realization and support of revolutionary technology make every UNIKO oven long-lasting in time and guarantees impeccable performances. UNIKO had a striking success, certified by top Chefs from well-known restaurants and agritourisms in many counties. The UNIKO oven has also received outstanding recognitions abroad, in particular in Austria, Switzerland, Germany and Ireland. The design team of Fontana Forni has been able to guarantee, over the cooking time, a constant temperature for a period of 48 hours with a limited wood consumption equal to 4/6 kg per hour. Interior 50"	Interior 22"	Interior 18"	1342 lbs. Exterior 56"	Exterior 36"	Exterior 40"